I am currently doing a systematic read through the works of Friedrich Nietzche and, I must say with only being on the second book, I am absolutely loving it! I started reading Nietzche a few years ago when I first discovered philosophy and passion for it. At the time I only really read through the books by taking out Aphorisms from random parts. I did read Thus Spake Zarathustra from cover to cover though, and must have read Human All Too Human completely in fragmented and random sittings. So far on my read through I have finished the Birth of Tragedy and am now up to Section Five of Human, All Too Human. I thought that the Birth of Tragedy was an easy enough read. It dragged a bit for me at the beginning when I was trying to get into the writing style and towards the end when he was applying the study of Ancient Greece to Germany in his lifetime. Overall, I found it a little speculative and the criticisms of Socrates felt a little lacking when you factor in the political climate of Athens in Socrates' life. Human, All Too Human is a fantastic book though. After going back to it following my education in philosophy, it makes so much more sense. So much of the book seems wrapped in the history of philosophy. The attacks of religion were entertaining here and Nietzsche is in full psychologist mode. I am enjoying the read through as I am currently doing a paper which is mainly focused on Ludwig Wittgenstein. Nietzsche is the perfect sort of wind down from a day at work and some studying. I started this thread as I was hoping other people who have read Nietzsche would like to tell me their favourite books by the guy or on the guy. What should I look forward to and what were your favourite books and why? I would rather leave "Nietzsche is crap" comments out of this and reserve this for the fans, although this is a free forum. Just a note, my enjoyment is not indicative of thinking Nietzsche is correct. My favourite philosopher is probably Plato and I think a lot of what he says is nonsense. Jordan Peterson spoke very highly of Nietzche, and how he used words so wisely. Ie: He said “God is dead” not triumphantly but rather as a way of saying society had no longer applied such ideals. 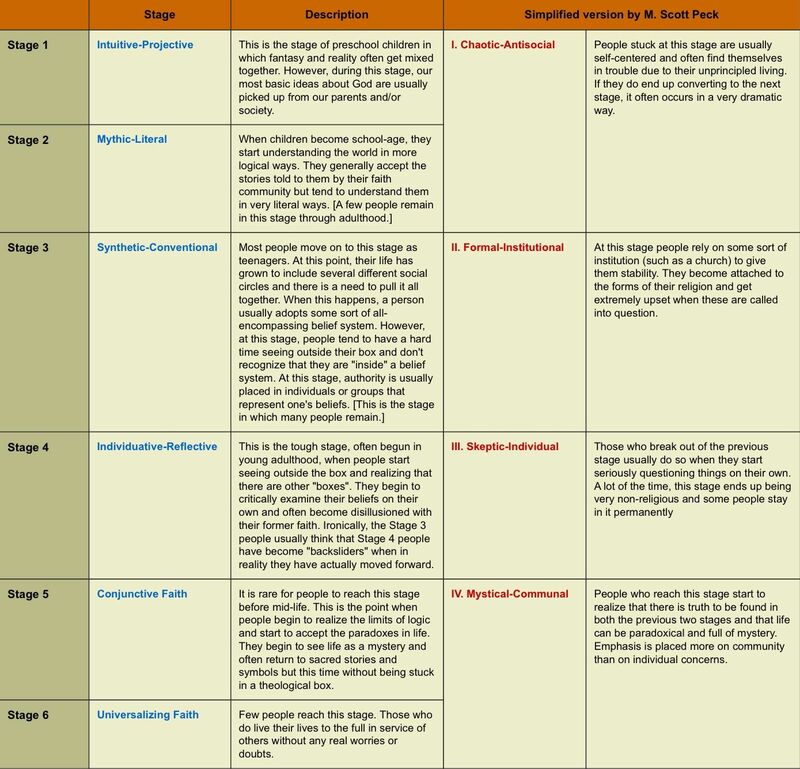 I also consider interpreting that as suggesting society had moved on (to faith stage 4... https://i.pinimg.com/originals/38/b4/28 ... bc77d7.jpg). Jung similarly suggested that Christianity had been taken over by something not really of God. For books on Nietzsche I like Laurence Lampert: “Nietzsche's Teaching: An Interpretation of Thus Spoke Zarathustra” and “Nietzsche's Task: An Interpretation of Beyond Good and Evil”. writings, but points away from himself whereas Nietzsche points most emphatically to himself, to "Mr. Nietzsche." Now Nietzsche "personally"
most personal" books (letter to Karl Knortz of June 21, 1888). As the very term personal," ultimately derivative from the Greek word for "face "
indicates, being "personal" has nothing to do with being "profound" or with being "perfect in regard to language." What is dimly perceived and inadequately expressed through our judgement on Beyond Good and Evil, is stated clearly by Nietzsche in his account of that book which he has given in Ecce Homo: Beyond Good and Evil is the very opposite of the "inspired" and "dithyrambic" Zarathustra in as much as Zarathustra is most far-sighted, whereas in Beyond Good and Evil the eye is compelled to grasp clearly the nearest, the timely (the present), the around- us. This change of concern required in every respect, "above all also in the form," the same arbitrary turning away from the instincts out of which a Zarathustra had become possible: the graceful subtlety as regards form, as regards intention, as regards the art of silence are in the foreground in Beyond Good and Evil which amounts to saying that these qualities are not in the foreground in the Zarathustra, to say nothing of Nietzsche's other books. antagonist of Plato, he "platonizes" as regards the "form" more than anywhere else. There is a great deal here that will go unnoticed by the casual reader (the kind of reader Nietzsche said he despised).